Discover the Motor City before the motor: a muddy port town full of grog shops, horse races, haphazard cemeteries and enterprising bootstrappers from all over the world. Meet the argumentative French fugitive who founded the city, the tobacco magnate who haunts his shuttered factory, the gambler prankster millionaire who built a monument to himself, the governor who brought his scholarly library with him on canoe expeditions and the historians who helped create the story of Detroit as we know it: one of the oldest, rowdiest and most enigmatic cities in the Midwest. 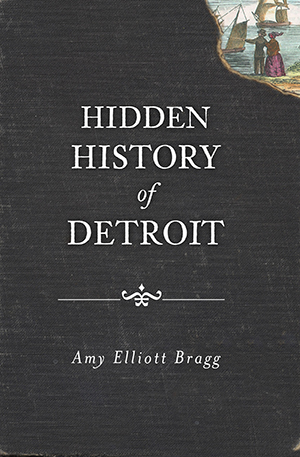 A native Detroiter, Amy Elliott Bragg left home for a while to edit an arts and culture magazine in Milwaukee. She returned to Detroit in 2009 where she lives with her husband, freelances as a writer and editor, and works hard at old books.